The colossal storm is expected to make landfall later tonight with winds expected to reach 80 miles an hour along with torrential rain which will bring flooding to large parts of the country. 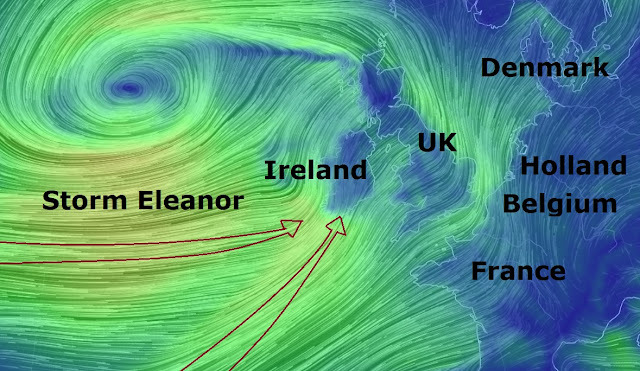 It is likely forecasters will name the fifth storm of the season on Tuesday – Eleanor – following Dylan on New Year’s Eve. The Daily Mirror claim, combined with a period of high tides, it is likely that some western coastal communities will be affected by large waves and spray, and there is a small chance that injuries and danger to life could occur from large waves and beach material being thrown on to sea fronts, roads and coastal properties. Power cuts and disruption to other services (mobile phones for example) may occur, and there is a small chance of transport disruption or cancellation of public transport. The lively weather is set to move eastwards across the country and there is a danger of quite significant snowfall in the north of Scotland, even at lower levels, low pressure pulls in colder air from the Arctic.